Whaddup whaddup! New meal prep Monday post! I took a couple of weeks off the Meal Prep posts - here in Australia we've had two long weekends in a row, followed by my birthday weekend, so my routine was all out of whack - but now I'm back! 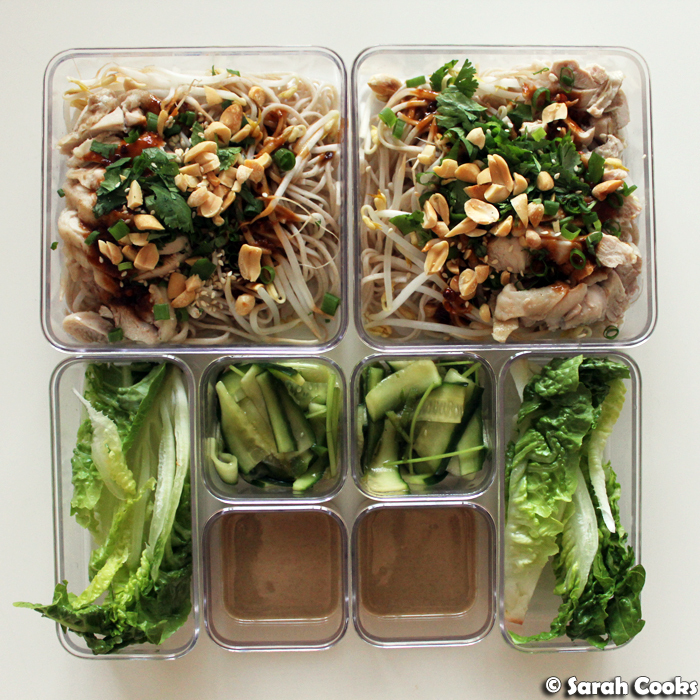 So, for your enjoyment, I've got a Chinese meal prep this week - spicy cold noodles with poached chicken, in an addictive sesame-chilli sauce, with lots of crunchy peanuts, as well as a cucumber tiger salad and baby gem lettuce with sesame sauce. These recipes all come by way of Fuchsia Dunlop's excellent book, Every Grain of Rice, with some adaptations and changes from me. I've told you about this before (at length! ), but Fuchsia Dunlop is seriously awesome, and her recipes are my go-to for (mainland) Chinese cuisine. I hadn't made or eaten any cold spicy noodles in ages, but I ordered a bowl at New Tapei back in February, and it reminded me just how good they are! They're really easy to make too - you just stir a few different sauces together to make the dressing, and stir it through cooked noodles. And being cold, I thought they'd make a perfect meal prep. Fuchsia has quite a few different recipes for this type of noodle dish, and I mixed a couple of the recipes together, and added poached chicken to make it more substantial. 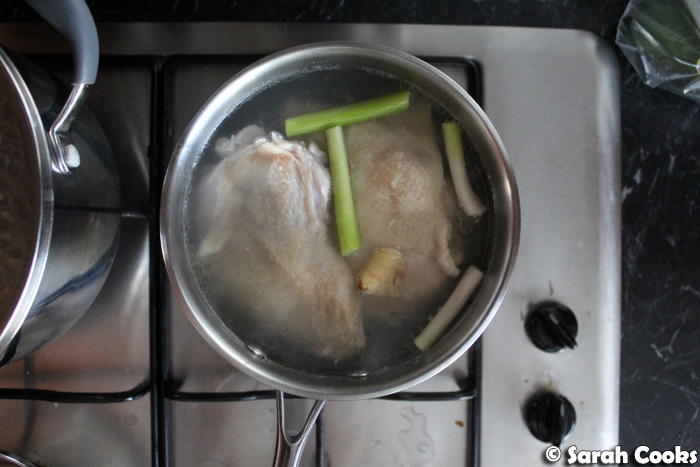 The chicken smelled so good as it was poaching - adding ginger and spring onions to the poaching liquid really makes a difference. It smelled like Hainan chicken rice as it was cooking! 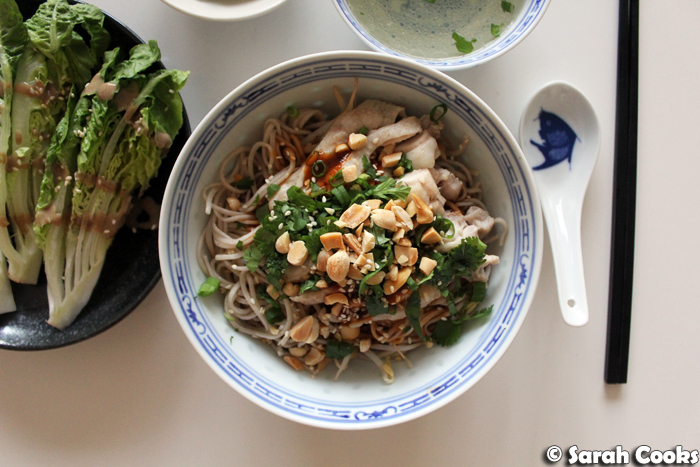 So - here are all the elements for the noodles - cooked noodles (I used soba, incongruously, because I love the hearty texture and nutty taste), the poached chicken, bean shoots, the sauce (full recipe below), chopped coriander, chopped spring onions, toasted peanuts and sesame seeds. 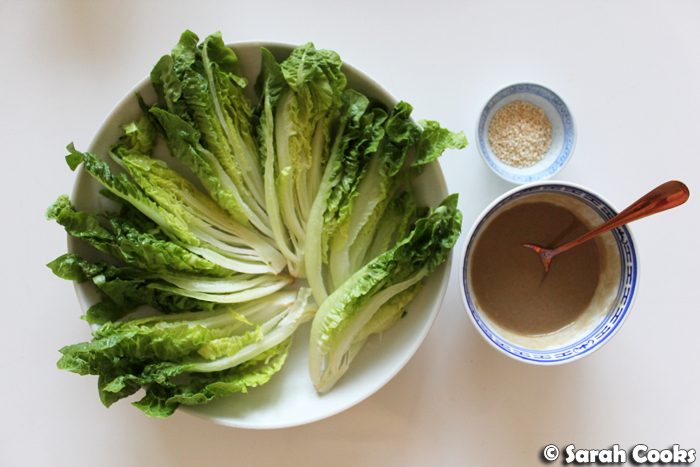 I made a simple side salad of baby gem lettuce wedges, with a sesame sauce. (Fuchsia suggests using this dressing on cooked spinach; that seemed like way too much effort). The sesame sauce is so easy, and surprisingly delicious. You just stir some sesame oil through sesame paste (I used tahini, but obviously Chinese roast sesame paste is more authentic), and add a pinch of sugar. I want to use this sauce on everything now! 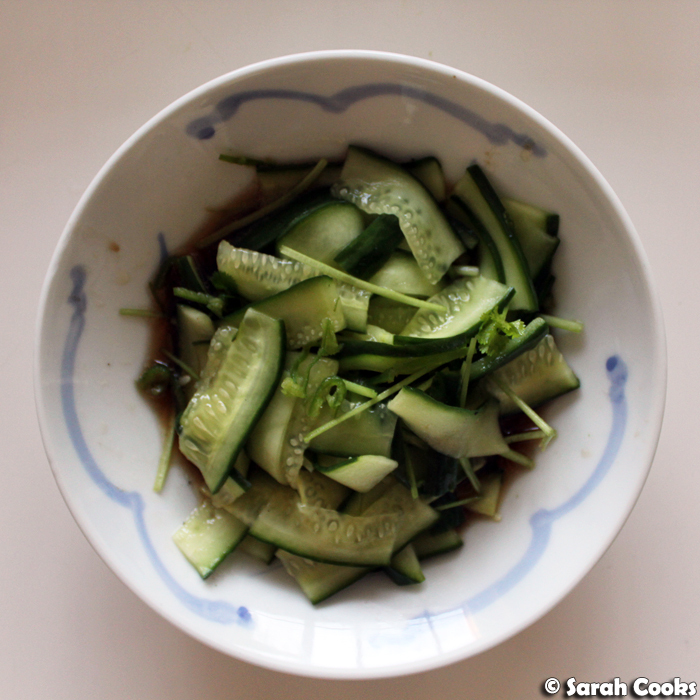 And for some more green freshness, I made a cucumber salad. This salad is called a "tiger" salad, and I believe the name refers to the fact that it has green chilli and coriander stems. Super tasty! So, for the noodles, I used 300 grams of soba, which I thought would be the right amount for four meals - boy, was I wrong! The soba cooked up voluptuously, and there was actually enough for six generous serves. (Whoops). Anyway, it just meant I could have a bowl on Sunday night (see top photo, and photo below) for dinner, and give a serving to my parents to try. (You'll see I also had a bowl of the chicken-poaching liquid as a soup with my dinner on the Sunday - delicious). Here they are, all packed up. And now with the cucumber, lettuce and the sesame sauce. This was one of my favourite meal preps! 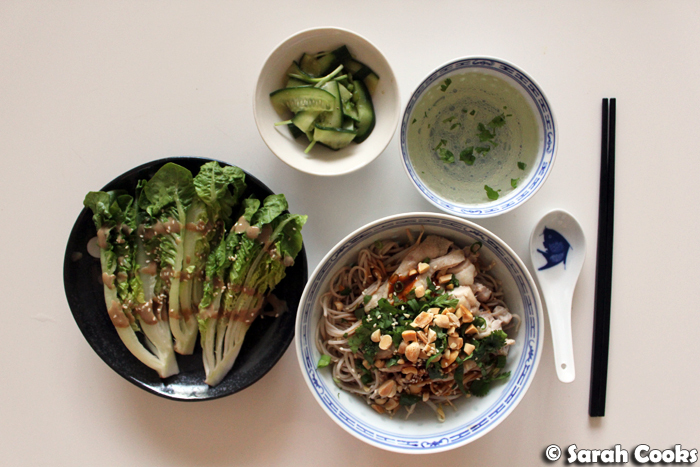 I loved the strong flavours of the noodles, and the crunchy freshness of the vegetables. I was definitely happy eating this the whole week! I can't believe something that tastes so complex was so easy to make. Enjoy! Fill a small saucepan with enough water to cover 2 skin-on chicken thigh fillets. Bring to the boil. Add the chicken to the pot, bring to the boil again. Add 1 small piece lightly crushed fresh ginger, and 4 lightly crushed spring onion whites. Turn the heat to low so that it simmers gently, and poach for approx. 15 minutes, or until cooked through. Remove the chicken from the pan and set aside to cool. Chop into chopstickable pieces. Cook 300 grams soba noodles according to packet instructions. Rinse under cold water to arrest the cooking. 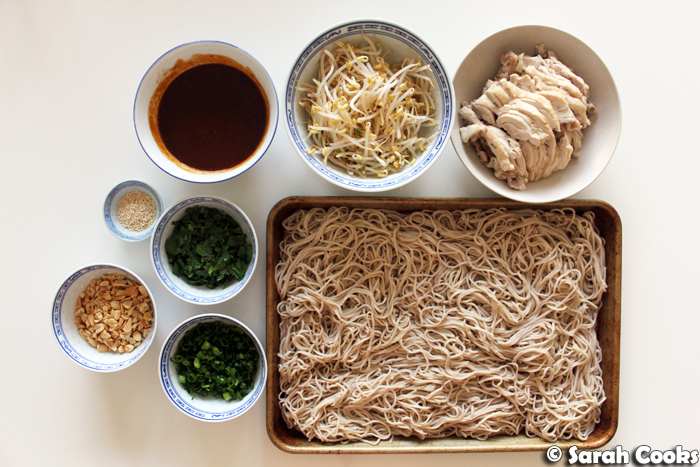 Mix through 1 teaspoon oil and spread the noodles out on a tray to cool completely. Place 150 grams bean shoots in a bowl. Pour over boiling water from a kettle and allow to sit for 3 minutes. Drain and set aside. For the sauce, mix together 4 tablespoons soy sauce, 4 teaspoons black Chinese vinegar, 4 tablespoons tahini, 6 teaspoons caster sugar, 4 teaspoons crushed garlic, 1/2 teaspoon ground roasted Sichuan pepper, 4-6 tablespoons chilli oil and 1 teaspoon sesame oil. 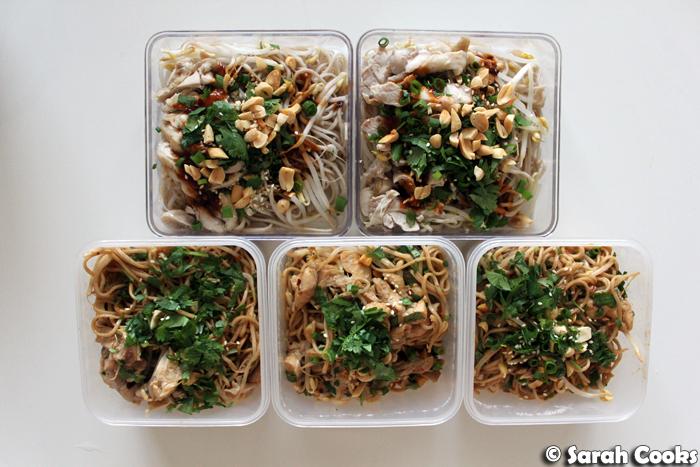 Mix together the noodles, beanshoots and sauce and arrange in bowls or containers. Top with the cold chicken pieces, and garnish with finely sliced spring onion greens, chopped fresh coriander, toasted sesame seeds and toasted chopped peanuts. Wash 1 little gem lettuce and slice lengthways into 8 wedges. Arrange on a plate or into serving containers. Toast 1 teaspoon sesame seeds in a dry frying pan until golden brown and fragrant. Set aside. Mix together 4 tablespoons tahini, 1 teaspoon sesame oil, 2-3 pinches caster sugar and salt to taste. Drizzle the sesame sauce over the lettuce wedges and sprinkle with the sesame seeds. Cut a continental cucumber in half lengthways, then cut each piece crossways into three pieces. Slice each piece lengthways thinly and place into a bowl. Sprinkle with 1/2 teaspoon salt and set aside for 30 minutes. Wash a small handful coriander stems and slice into lengths that match the cucumber slices. Thinly slice 1 green chilli and discard the stems and seeds. To make the dressing, mix together 1/2 teaspoon caster sugar, 4 teaspoons black Chinese vinegar, 1 teaspoon sesame oil and a grinding of pepper. Drain the cucumber. Mix with the coriander stems, green chilli and dressing. Ooh great idea! I always tend to give Mr NQN sandwiches but I really should start doing more lunchboxes like these. He really likes noodles etc. I'm totally stealing this idea for work lunches! Especially loving the sound of the cucumber tiger salad. Yum.